The American Culture of War presents a sweeping critical examination of every major American war since 1941: the Second World War, Korea, Vietnam, and the First and Second Persian Gulf Wars. As he carefully considers the cultural forces that surrounded each military engagement, Adrian Lewis offers an original and provocative look at the motives people and governments used to wage war, the discord among military personnel, the flawed political policies that guided military strategy, and the civilian perceptions that characterized each conflict. With each chapter similarly structured to allow the reader to draw parallels between the wars, Lewis deftly traces the evolution of US military strategy since the Second World War. 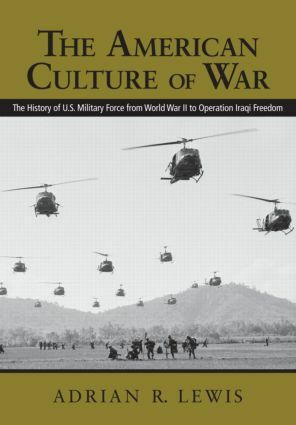 Timely, incisive, and comprehensive, The American Culture of War is a unique and invaluable survey of over sixty years of American military history. For additional information and classroom resources please visit The American Culture of War companion website at www.routledge.com/textbooks/9780415979757.